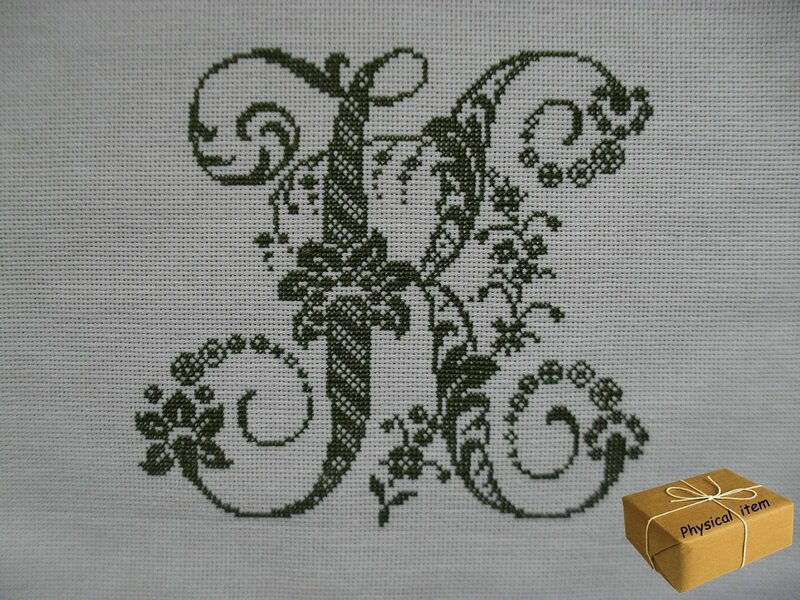 Nice elegant antique letter “K” of French design, cross-stitched by myself. It is a finished item, washed and steam-ironed. It will make a beautiful framed picture, personal Christmas gift-bag monogram, a pillowcase or a fine apron decoration. It will also decorate your patchwork and quilting projects – quilts, bags, hot-pads, etc. The letter is carefully embroidered on 100% cotton 14-count Aida fabric with 100% cotton DMC embroidery threads (DMC color 936). All cross stitches are even and made in one direction. There are NO KNOTS on front and back sides (you can also see the back side on photos). If you want this letter (or any other letters of this design - please, see the gallery) embroidered in some other colors, feel free to send a message to me (use "Contact Us" form tag in the right down corner). Please NOTE: if this item is made to order, it will take 5 working days to be embroidered, washed and ironed. We discuss all the matters first (cross stitch chart, color variations, canvas count/color/size type), then I create your personal item, send you the photos, add your personal listing to my Store, you pay for the item, I send the item to you. That’s it!